Classic elegance, modern comfort and services adapted to your needs is what we offer for your business trip or wonderful holidays in Madrid. 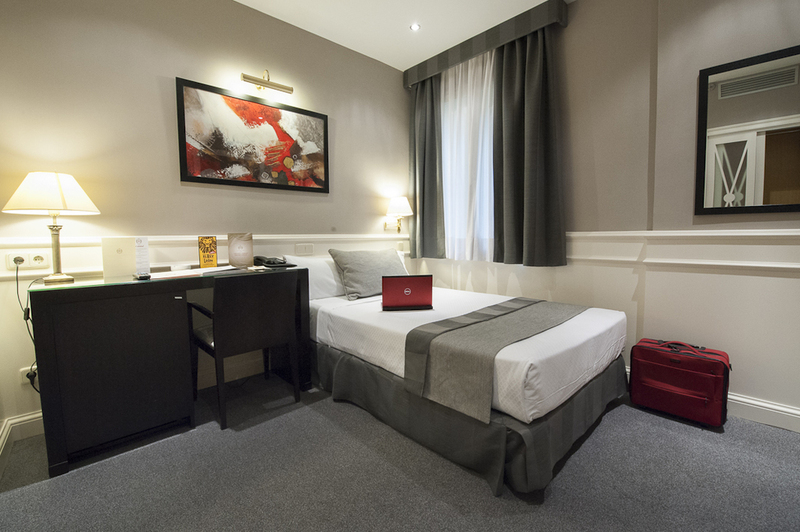 Whether you are travelling for business or pleasure, this is the ideal room to enjoy a solo trip to Madrid. All Single rooms are quiet and comfortable and equipped with bathroom or shower, kettle and access to the swimming pool during summer season. 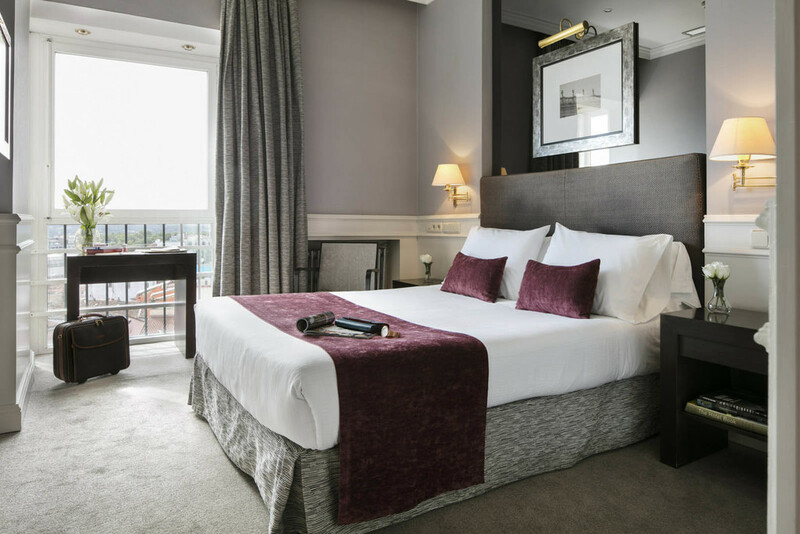 Inspired by the hotel’s original elegant decoration, it is the perfect room for both guests who need to be in touch with the city and those who require peace and quiet in the heart of Madrid’s Gran Vía. All Classic rooms are equipped with bathroom or shower, kettle and access to the swimming pool during summer season. Ideal for guests who wish to be reminded at all times that they are in Madrid, this room type offers a view of the unique Royal Palace and a modern decoration. The rooms are equipped with bathroom or shower, kettle and access to the swimming pool during summer season. 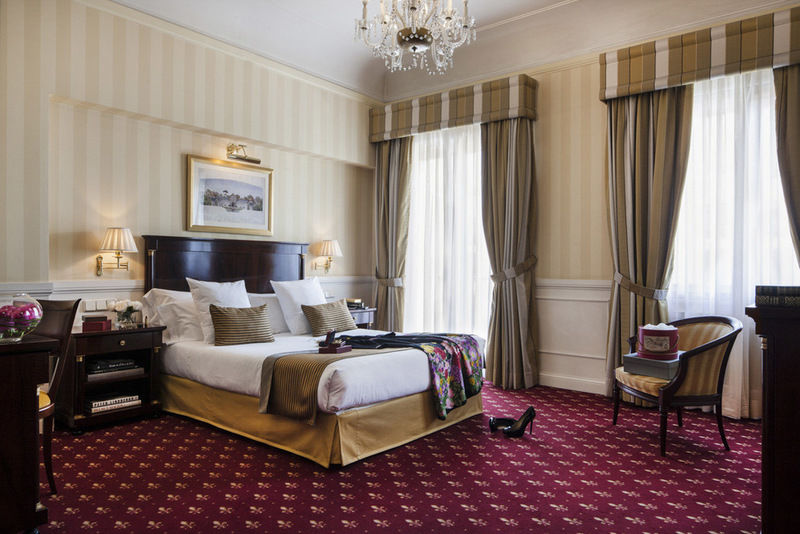 The most authentic rooms in the hotel, all of them with views of Gran Vía. They include a Nespresso coffee machine, kettle, bathrobe, slippers and a courtesy bottle of mineral water on arrival. The room is also equipped with bathroom or shower and access to the swimming pool during summer season. 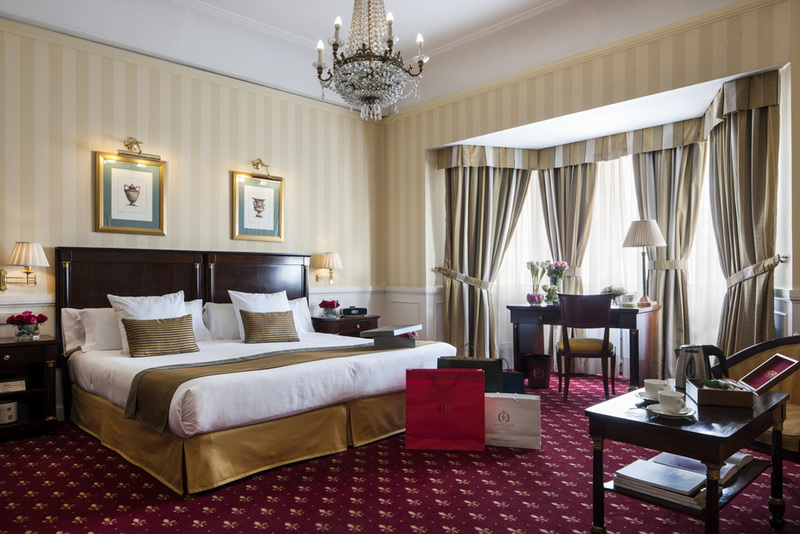 Our Junior Suites are the ideal choice for our most demanding guests. 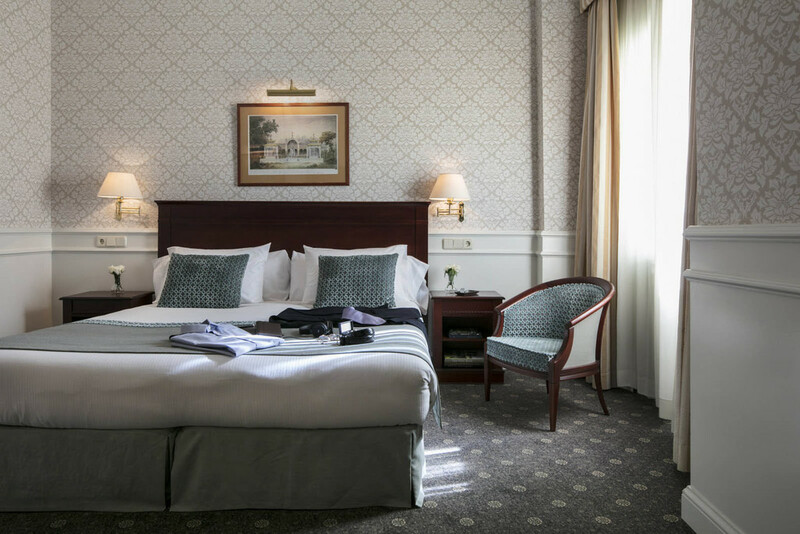 Exterior and spacious suites equipped with Nespresso coffee machine, kettle, bathrobe, slippers and a courtesy bottle of mineral water on arrival. They also include access to the swimming pool and sunlounger area in summer, from where you can enjoy fantastic panoramic views of the city. 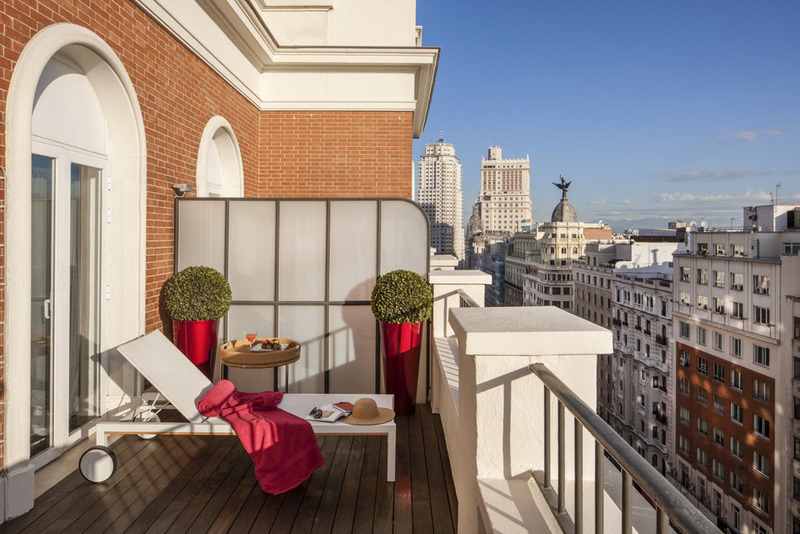 Emblematic suites located on the corner of Gran Vía and Calle San Bernardo, with windows overlooking both avenues. They are famous for the characteristic round shape of their large windows and for their elegant and classic decoration. All Corner Junior Suites include a Nespresso coffee machine, kettle, bathrobe and slippers and a courtesy bottle of mineral water on arrival. It also includes access to the swimming pool and sunlounger area in summer, from where you can enjoy fantastic panoramic views of the city. 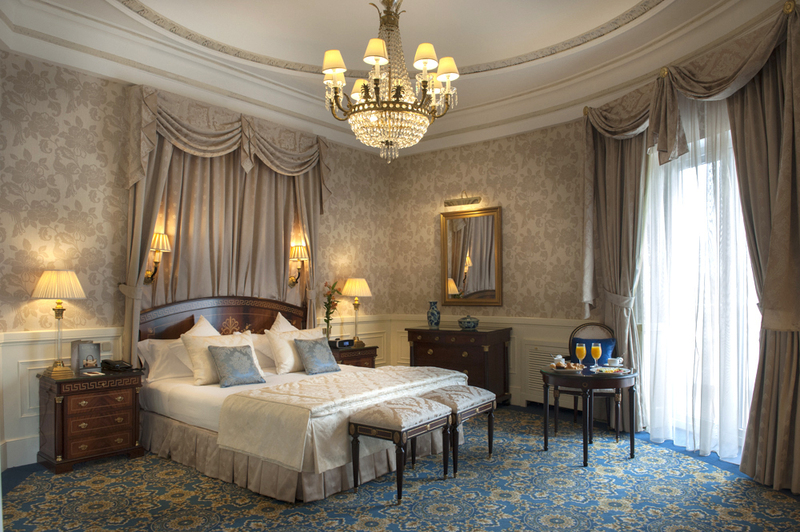 Our most exclusive suite is located on the eighth floor of the hotel, offering classic and elegant decoration in blue tones. From the suite you can also enjoy exclusive views of the city from its terrace and balcony and it is equipped with a Nespresso coffee machine, kettle, bathrobe, slippers and a courtesy bottle of mineral water on arrival. It also includes access to the swimming pool and sunlounger area in summer, from where you can enjoy fantastic panoramic views of the city. As its name indicates, if you want to enjoy a 100% Emperador experience, this is the room for you. 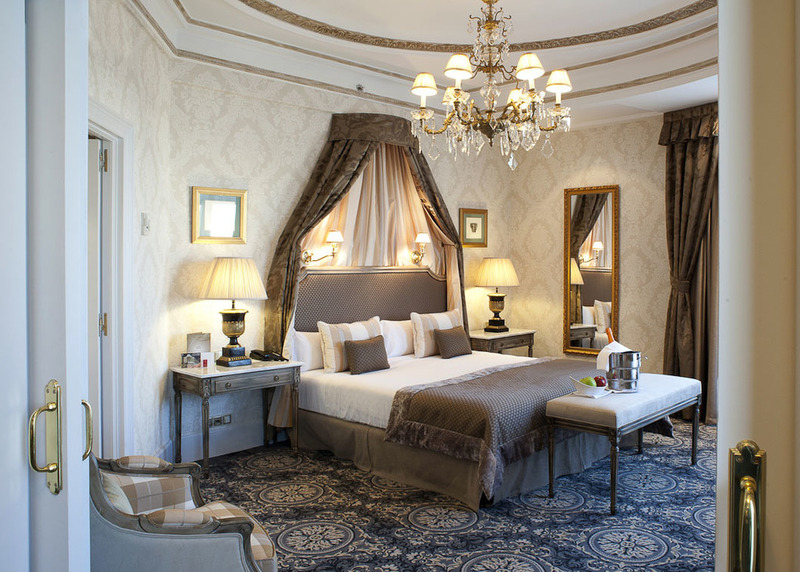 Located on the ninth floor of the hotel, it offers a classic and elegant decoration with beige tones. From the suite you can also enjoy exclusive views of the city from its terrace and balcony and it is equipped with a Nespresso coffee machine, kettle, bathrobe, slippers and a courtesy bottle of mineral water on arrival. It also includes access to the swimming pool and sunlounger area in summer, from where you can enjoy fantastic panoramic views.